Providing feedback to students is an important part of their growth. Various commenting options are available in Chalk & Wire to ensure that you have the necessary tools to provide your students with the best possible feedback. Targeted Text Comments are made possible when using the Advanced Commenting feature. Targeted Text Commenting allows you to select any text within the student's work to comment on the content, grammar, and spelling. Targeted Text commenting is not available on mobile devices. You must use a computer to use this type of commenting. 1. 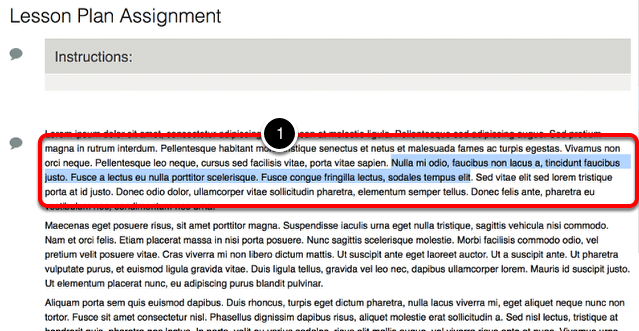 Using your cursor, highlight the text that you would like to comment on. 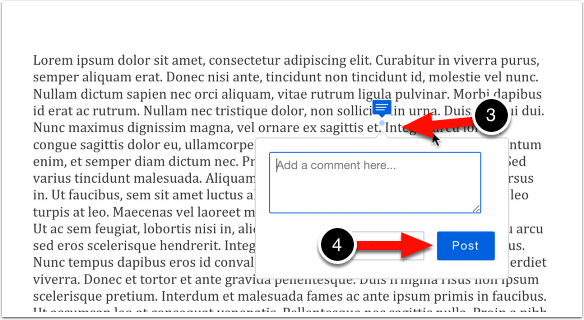 The highlighted text will prompt a pop-up window for you to add your comment. 2. Type your comment into the text box. 3. Select the Comment Type to save. Your comment will appear below submission's content, and will offer the options to Edit or Delete. You may also view the comment by hovering your cursor over the highlighted text within the submission's content. If a student uploads a Word document, Excel file, Powerpoint file, or PDF file to their portfolio or assignment and makes a submission, an Assessor can then view the document within the assessment and make annotations on it. Once the assessment, including annotations, has been completed and released to the student, the student will be able to review the annotations. Please note that Box view does not work on mobile devices, and may have limited functionality on computers with touch screens. If you are unable to make a selection using a mouse or trackpad, please try using the touch screen functionality. If the functionality is too severely impacted for your ease of use, please consider using a different computer. 1. Locate the document and click on the View button. The document will open directly on the page. 2. Click on the Comment icon in the top, right corner. A message will appear instructing you to click anywhere to add a comment to the document. 3. Click anywhere in the text to add a point comment. A comment box will appear, which you can type in. 4. Click Post to post the comment. 5. 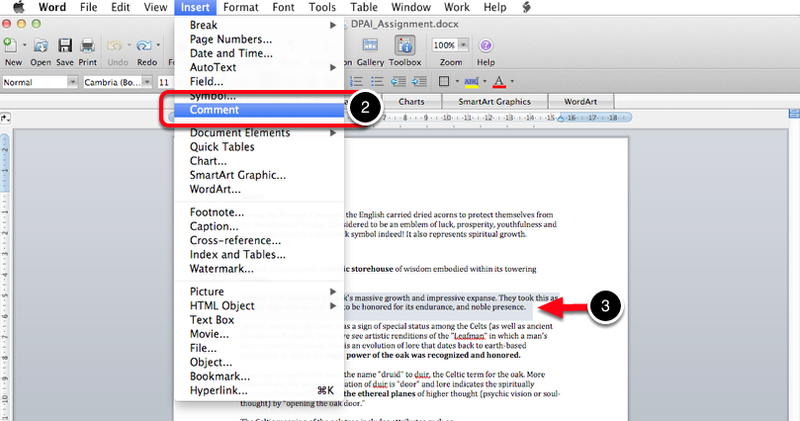 Click on the Highlighter icon to save the highlighted section. 6. Click on the Comment icon to leave a comment on the highlighted section. 7. 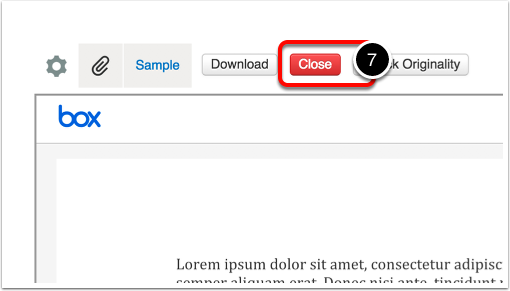 Click on the Close button. If a student uploads a document file to their ePortfolio and makes a submission, their Assessor can then download the document and make annotations on it offline. Once the annotations have been made, the updated document can be uploaded to Chalk & Wire for review by the student. 1. 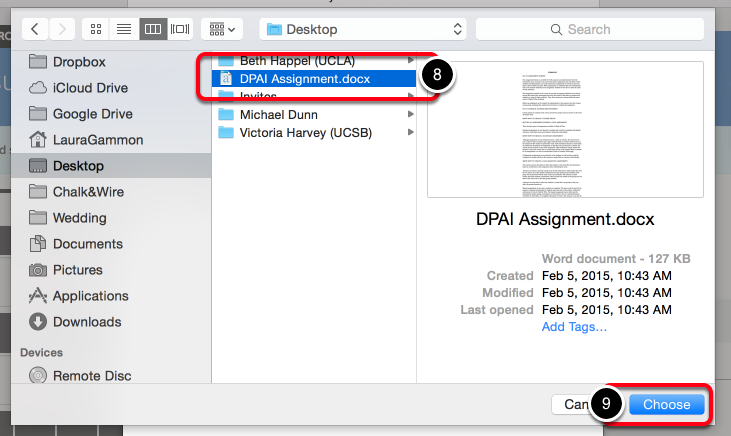 Locate the document, and click on its name to download it. Once the file has downloaded to your computer, locate and open it. 2. Highlight the text that you wish to comment on. 3. Use the Insert menu to select Comment. 4. 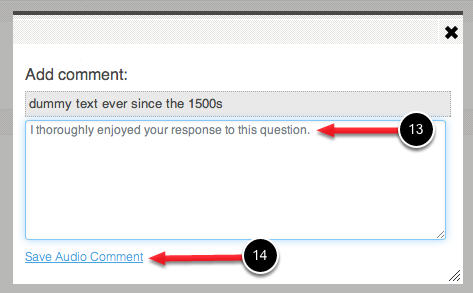 Add your comment in the provided text-entry field. Save the document as a new file, naming it and locating it somewhere memorable. 6. Click the Paperclip icon to attach your annotated file. 7. 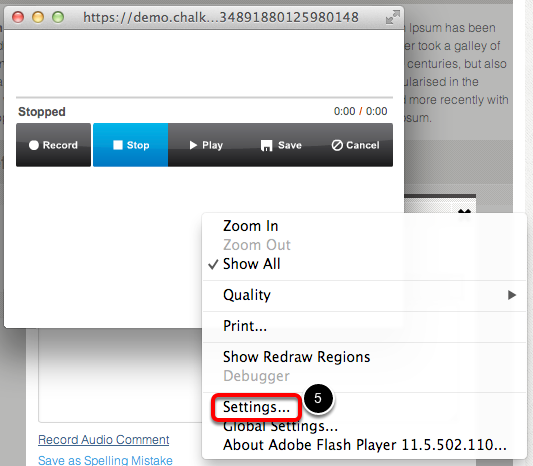 Click on the Choose File button to search for annotated file. 8. Locate and select the file on your local hard drive. 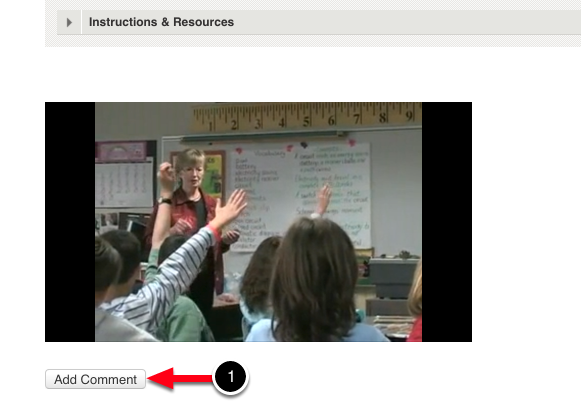 Video commenting enables Assessors to comment on videos provided by the student via submission. Assessors can leave text or voice comments on videos, targeting specific sections of the video or as a whole. 1. Watch the video in the submission, and click the Add Comment button. 2. 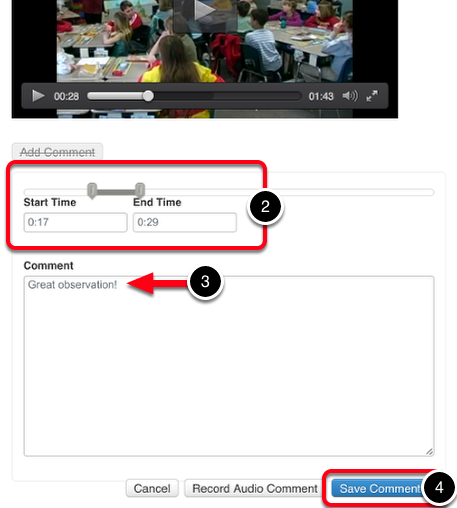 Use the slider bars to set the Start Time and End Time for the comment, if it is specific to a certain section of the video. 3. Enter your comment in the text field. 4. Click the Save Comment button. 5. 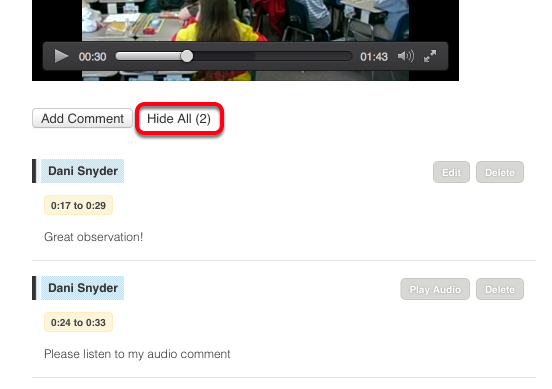 To leave an audio comment, click the Record Audio Comment button. 6. 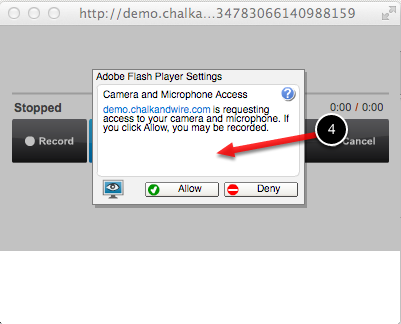 Click Allow in the Adobe Flash Player Settings access window. 7. Use the Record button to begin your recording. 8. When you are finished recording, click the Stop button. 9. To listen to your recording, press the Play button. 10. 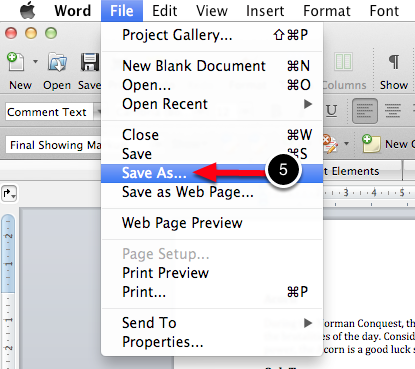 To save your recording, press the Save button. 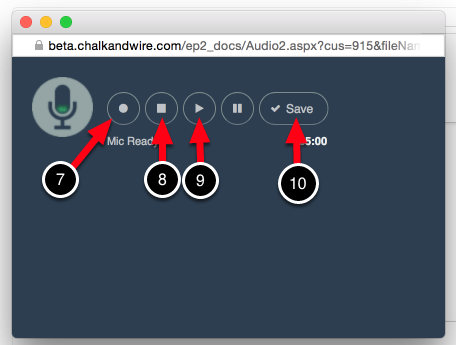 To leave the recording window with your saved audio comment in tact, click on the exit button for the window. 11. Use the slider bars to set the Start Time and End Time for the comment, if it is specific to a certain section of the video. 12. 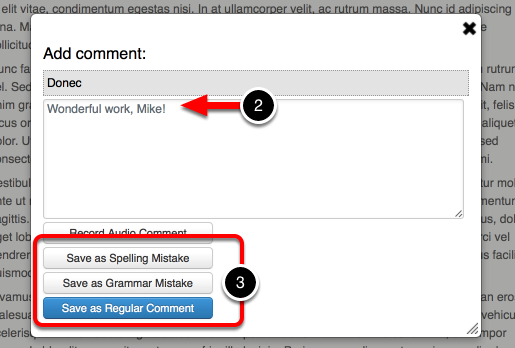 (Optional) Enter a text based comment, in addition to the audio comment, in the text field. 13. Click the Save Audio Comment button. To review the comments on the video, click the Show All (#) button beneath the video. 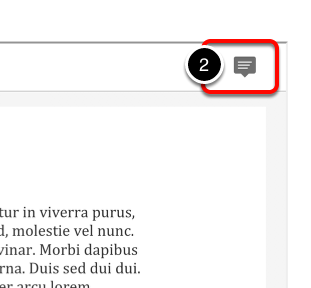 Once comments are visible, the button will read Hide All (#). 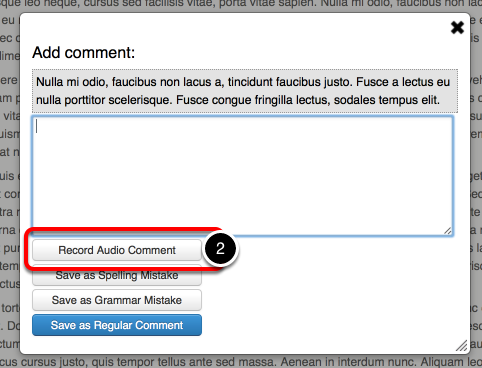 The Audio Commenting feature allows assessors to verbally record comments, rather than typing text comments. If you are using a Mac computer, we recommend that you use either Safari or Firefox as your internet browser when recording audio comments. Chrome has a known issue with sound quality which may affect the audio that is recorded. 1. Highlight the text that you would like to comment on. 2. When the comment pop-up windows appears, select the Record Audio Comment option. 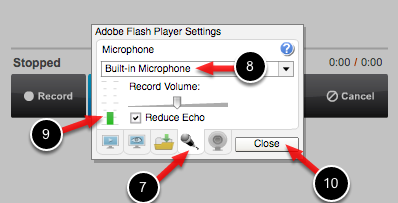 Mac: Hold down the Control key on your keyboard + click on the Adobe Flash Player Settings window with your mouse. 4. Select 'Settings...' in the drop-down menu. 6. 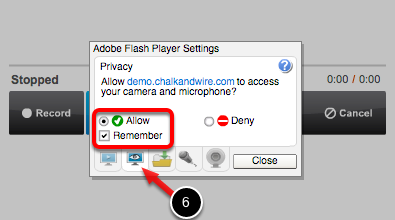 Select the Privacy tab and ensure that Allow and Remember are both selected. 7. Select the Microphone tab. 8. 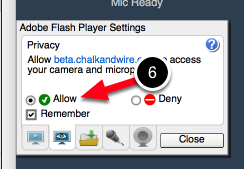 If you are using your internal microphone (built into your computer) to record audio, ensure that the Built-in Microphone option is selected. If you are using a headset or another type of external microphone which you have connected to your computer, use the drop-down menu to select the appropriate microphone. 9. Test your microphone by speaking. If you have selected the correct microphone option, you will see the green bar move as you speak. If you do not see this green bar, you have either not selected the correct microphone or you need to turn your microphone on using your computer preferences first. 11. 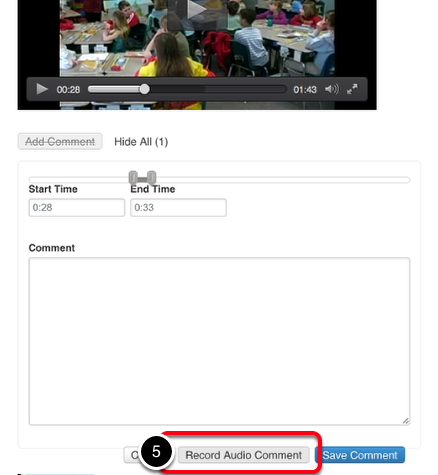 Use the 'Record' button to begin recording your audio comment. Speak into your microphone and click 'Stop' when finished. 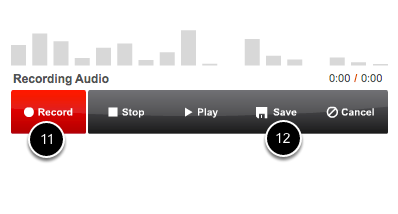 If you wish to listen to your recording before saving it, use the 'Play' button. 12. When you are satisfied with your audio comment, click 'Save'. 13. 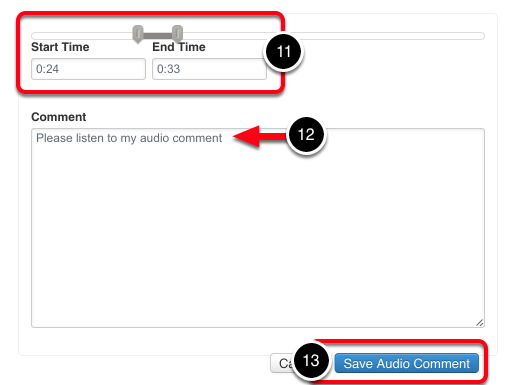 (Optional) Enter a text based comment, in addition to the audio comment, in the text field. 14. Click the Save Audio Comment button. What is a Resubmission Request? I used the 'forgot you password?' link, but have not received an email - where is it? I don't see my program/course anywhere in my account, where is it? How do I submit work to my assessor? Why doesn't my assessor's name appear when I try to submit to them? Why are buttons missing or not working in my account? How do I withdraw a submission that I made to my assessor? Where can I view my assessment results/grades? How do I share my portfolio with someone who doesn't have Chalk & Wire? How do I add images to my portfolio?